Roger Dawson (La Habra Heights, CA) is one of the country's top experts on the art of negotiating. As a full-time speaker since 1982, he has trained executives, managers, and salespeople throughout the U.S., Canada, Asia and Australia. He is one of only a few professionals in the world to have been awarded both the CSP and CPAE by the National Speakers Association, their two highest awards. He was inducted into the Speakers Hall of Fame in 1991. 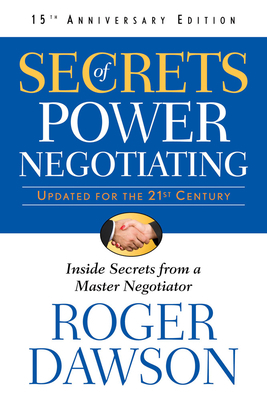 He is the author of Secrets of Power Negotiating, Secrets of Power Negotiating for Salespeople, and Secrets of Power Persuasion (all Career Press).